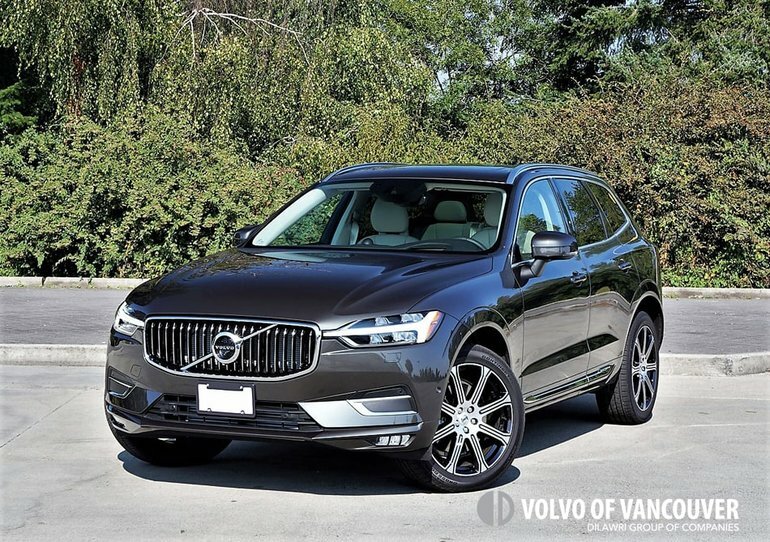 Now that Volvo has rejuvenated its mid-size XC90 SUV and followed up that winning formula with the S90 luxury sedan, V90 sport wagon and V90 Cross Country crossover wagon, it's time for the all-new 2018 XC60 compact SUV. At first glance the 2018 XC60 looks like a smaller, sportier variation on the XC90 theme, with a little V90 Cross Country thrown into the mix for good measure. I really like the design, particularly its wide rectangular waterfall grille, the Thor's hammer LED headlights, chiseled lower front fascia sporting LED fog lamps at both ends, sculpted flanks, swept up rear quarter window, and trademark vertical LED taillights that jut inward for more of an "L" shape than anytime previously. My T6 AWD Inscription tester rounded out the design with a stylish set of standard eight-spoke diamond-cut 20-inch alloys with black painted pockets, to dramatic effect. This model starts at $57,950 plus freight and fees, a considerable $12,050 more than entry-level T5 AWD Momentum trim that can be had for just $45,900. All XC60s receive standard all-wheel drive for 2018, plus an eight-speed automatic transmission connected up to a turbocharged 2.0-litre four-cylinder engine, but that's where the similarities end, at least under the skin. The XC60's T5 powerplant gains a full 10 horsepower from last year, making it good for 250 horsepower and the same 258 lb-ft of torque, which is better than its compact luxury SUV class average, but then again my T6 tester's 316 horsepower and 295 lb-ft of torque version of the same four-cylinder engine, also infused with a supercharger in this trim, really makes a difference off the line. Before delving into a full driving dynamics report, Volvo also offers the new XC60 with same T8 eAWD plug-in hybrid Twin Power unit I drove previously in the XC90, making an identical 400 horsepower and 472 lb-ft of torque for a claimed sprint from zero to 100km/h of just 5.3 seconds, but unfortunately this bit of class-leading technology will need to wait for a future review. 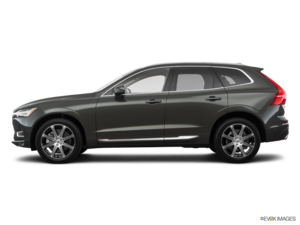 With respect to technology leadership, even this Volvo XC60 T6 AWD leads the category as far as powertrain innovation goes. No competitors offer both turbocharging and supercharging and therefore none manages anywhere near the same output per displacement, the result being superb fuel economy, especially when stacked up against the big six-cylinder powerplants competitors need to match the T6' 2.0-litre four. Aided by standard auto start/stop to further save fuel while also reducing emissions, the new XC60 T6 AWD achieves a claimed 11.4 L/100km city and 8.7 highway, whereas the base XC60 T5 AWD is good for 10.6 L/100km city and 7.6 highway. As for the XC60 T8 eAWD, we can only guess this smaller, lighter, compact SUV should be a bit better on fuel than mid-size XC90 T8 eAWD, and that model is rated at 10.1 L/100km city, 8.8 highway and 9.5 combined. This said, when factoring in regular charging an owner can potentially drive the XC90 T8 eAWD every day without ever needing to fill the tank, although the XC90 T8 eAWD's official Le/100km (gasoline litres equivalent per 100 kilometres) rating is more conservatively estimated at 4.7 combined city/highway. Efficiency is important in today's market, but the way the XC60 drives should do much more to transition fence sitters from mere roadside admirers to Volvo's legions of loyal owners. To this end Volvo provides two distinct XC60 driving experiences, the first targeting comfort-oriented buyers via the base Momentum and this luxuriously appointed Inscription trim level, with the second for those seeking higher levels of performance, manifested in the R-Design and upcoming 421-horsepower T8 eAWD-motivated Polestar. I've driven previous Volvo Polestars before so I'm totally stoked to test the latter, yet the number of Momentum and Inscription trimmed Volvos on the road tells me more luxury SUV buyers prefer being pampered. The XC60 Inscription's ride quality might be best in class. Really, it's superbly smooth and I wasn't even being treated to the optional four-wheel air suspension with driver-selectable variable dampers, a $2,350 upgrade Volvo calls Four-C Active Chassis. The standard suspension setup incorporates double wishbones up front, in place of the outgoing model's MacPherson struts, plus an integral link setup in back, with both ends kept taut by stabilizer bars. Without question the incredibly comfortable driver's seat helped the situation, yet as cosseting as the new XC60 Inscription is, it more than holds its own when pushed quickly through circuitous tarmac, especially when its glitzy scrolling metal drive mode selector is pointing to its sportiest Dynamic setting. This quickens throttle and transmission response while seeming to sharpen steering and suspension settings too, all allowing the big 255/45R20 Continental CrossContact LX Sport all-seasons underfoot to make the most of any fast-paced situation. The sizeable tires don't add much ride harshness or road noise to the XC60's cabin either, or at least Volvo managed to leave such adversities outside the extremely quiet interior by building an ultra-rigid body structure and filling its cavities with sound-deadening insulation, followed by the installation of a tightly fitted, high quality interior. You're going to like it in here. My tester was finished in a Blond cream and Charcoal black two-tone effect, while the inlays were gorgeous genuine open-pore hardwood that looked like light oak but are named Driftwood. Satin-silver metals brightened up anything not already wowing eyeballs, the latter including contrast-stitched leather on the dash and piano black lacquer around the infotainment display, not to mention the aforementioned cylindrical drive mode selector joined by a similarly bejeweled rotating diamond-patterned bright metal ignition switch on the lower console, and likewise by the outer rim of the audio volume and infotainment dial up on the centre stack. Of course, the artful aluminum speaker grates of the $3,250 optional Bowers & Wilkins audio system won't go unnoticed either, especially the centre dash-mounted tweeter, while the two-tone leather-wrapped steering wheel is a visual and tactile feast. I should immediately segue into the sumptuously soft perforated Nappa leather upholstered seats, but I can't help but be distracted by the Inscription's standard fully configurable colour TFT gauge cluster. It helps keep your eyes focused ahead by placing key details, such as navigation mapping, between the digital dials on its massive multi-info display, functions that were also directed upwards onto the windshield thanks to Volvo's available Graphical Heads-up Display. This comes standalone for $1,150 or as part of a $2,300 Climate Package w/HUD package that also adds heated wiper blades, a heatable steering wheel, and heated rear outboard seats. I might as well tell you everything else added to my tester, the $1,800 Vision package including power-folding and auto-dimming side mirrors to go along with the Inscription's standard auto-dimming rearview mirror, blindspot monitoring with rear cross-traffic alert, a 360-degree surround parking camera, front parking sensors to augment to already present rear sonar, plus Park Assist Pilot semi-autonomous self-parking. A $2,200 Convenience package added to the self-parking feature by including Pilot Assist, which is Volvo's semi-autonomous drive system that has the ability to steer, accelerate and brake on well-marked roads up to 130 km/h. The Convenience package also includes adaptive cruise control, which is basically the same thing with fewer autonomous features activated, plus a digital compass and HomeLink garage door opener integrated within the rearview mirror, power-retractable rear headrests, and power-folding rear seats. Lastly, the aforementioned Bowers & Wilkins audio system upgrade boasts a 1,100-watt amplifier and 15 strategically placed speakers for outrageously good sound quality, while a set of rubber mats and a cargo tray added $145 apiece, and the lovely greenish taupe Pine Grey Metallic paint added $900, the final tally slipping in just under $70k before adding freight and fees. I'll forgo reviewing all features that come standard with Momentum trim, other than saying Volvo's now trademark "Thor's Hammer" LED headlamps are joined by LED taillights, dual chromed tailpipes, metal doorsills, pushbutton ignition, powered and heated front seats with four-way powered lumbar support and driver's memory, leather upholstery, aluminum inlays, dual-zone auto climate control (with CleanZone that monitors incoming air and closes the intakes if harmful substances are detected, uses a multi-ﬁlter to reduce dust, pollen, particles and chemical odours, and automatically ventilates the cabin upon unlocking), an 8.0-inch colour TFT instrument cluster, rain-sensing wipers, voice activation, a 9.0-inch Sensus touchscreen with Apple CarPlay and Android Auto, a backup camera, a powered panoramic sunroof, a powered tailgate, and loads more. Volvos are renowned for the highest standards of safety, and the XC60 appears to be no different from models' past with its standard kit including front collision mitigation support (between 60 and 140 km/h), lane keeping assist (between 65 and 200 km/h), front seat whiplash protection, seatbelt pretensioners on all positions, all the usual airbags including one for the driver's knees, hill start assist, hill descent control, tire pressure monitoring, etcetera. Worthy of mention, last year's XC60 earned a best-possible five-star safety rating from the NHTSA and an equally impressive Top Safety Pick Plus rating from the IIHS when its optional headlights were added, and I expect nothing less from this 2018 model when it undergoes testing. There are plenty of other XC60 permutations, including additional options available with this Inscription trim and everything that comes with the R-Design, although I'll likely follow this review up with one for the sportier model in the near future. Until then, Inscription features not yet mentioned include the 20-inch alloys, articulating headlights with auto high beams and high-pressure cleaning, fog lamps, illuminated door handles with puddle lights, proximity-sensing keyless entry with hands-free tailgate opening, "High-Level" cabin illumination, the previously noted the 12.3-inch configurable TFT gauge cluster, road sign info, personal steering settings with low, medium or high assistance, driver-selectable Comfort, Eco, Dynamic, Off-Road and Individual "Drive-Mode" settings for adjusting its powertrain and steering characteristics, powered front seat bolsters and extensions, Sensus connected navigation with real time traffic info, four-zone auto HVAC with a cooled glove box, ventilated front seats, front passenger seat memory, the Tailored Dashboard instrument panel upgrade, netted pockets on the transmission tunnel, active noise control with engine/exhaust sound enhancement, and more, while you can also choose between a number of interior colour themes and inlay options. Before I close, a few more thoughts in favour of the new XC60. The noted Sensus infotainment system delivers the friendliest user experience in the industry. If you're familiar with an iPad or any Android tablet you'll be right at home with this large, well organized interface, but Volvo smartly offers instructions that pop up right when you need them, explaining how to tap, swipe and use other gestures to navigate through the system. I could go on and on talking about the XC60 Inscription's seats as well, not only for their comfort, but for how brilliantly modern and advanced they look. The rear seats are hardly lacking either, while roominess in back is borderline limo-like. With the driver's seat set for my five-foot-eight medium-build frame, I still had nearly a foot of space ahead of my knees plus four above my head, while the little SUV provided plenty from side-to-side. A wide leather-covered armrest flips down at centre, complete with a shallow lidded compartment for storing stuff kids might enjoy, like a pack of Uno playing cards, Pokemon trading cards, Fingerlings interactive baby monkeys, Hatchimals, one of Disney's 'Moana' magical seashell necklaces, any number of Lego people (the Hot Dog Man is best), fidget spinners, etcetera, while large, grippy cupholders slide out in front. The powered liftgate automatically causes a retractable cargo cover to move up out of the way for easier access to your gear, the area behind the rear seats measuring 505 litres while 1,432 litres are available with the 60/40-split rear seatbacks lowered via handy pushbutton releases that automatically flip forward the rear headrests before dropping the seats down. This is a brilliant idea, while alternatively you can leave all seats upright and simply slip longer items down the middle via a handy centre pass-through, a big bonus for skiers. All in all, the redesigned 2018 XC60 is a very impressive compact SUV that should make a major difference to Volvo's bottom line, while providing plenty of premium consumers with a truly unique Swedish style of luxury. I enthusiastically recommend it.